For some reason, we haven’t promoted a show by one of modern folk music’s leading lights – but we’re setting that record straight in October, when James Yorkston comes to town with his ‘Big Eyes Family Players‘. Joining him for this early Saturday show are Mary Hampton and David A Jaycock. 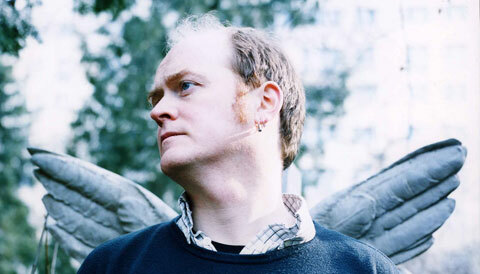 James Yorkston is a member of the Fence Collective and has released six albums on Domino Records. His most recent release is Folk Songs, a collaboration with The Big Eyes Family Players. This ever-changing instrumental classical/acoustic/folk group started out as Big Eyes in 2000. They were perennial favourites of John Peel and played with Daniel Johnston at his first UK gig in 2002. Somewhat randomly, the Paul Smith fashion house produced a range of Big Eyes Family Players t-shirts for their Japanese stores in 2008. The group are led by James Green and have previously featured Jeremy Barnes (A Hawk & A Hacksaw), Rachel Grimes (Rachel’s), Terry Edwards (Tindersticks/Gallon Drunk) and James William Hindle in their line-up over the years, as well as many others. While studying 20th-century music at university, Mary Hampton heard her first English folksong on a friendâ€™s mixtape, in between Frank Zappa and Penderecki. The song was The Snow It Melts the Soonest, the singer was Anne Briggs. It was the sheer exoticism of this sound mixed with the raw symbolism of its traditional text that became the starting point for her own song-writing. Throw into the mix a background in chamber composition and an ear for the more uncanny use of familiar sounds and youâ€™ll get some idea of her debut album My Motherâ€™s Children, which was released in 2008 and landed in Mojoâ€™s Top 5 Folk Albums of the Year. David A Jaycock has so far released two albums – on Early Winter Recordings and Manchester’s own Red Deer Club – and a single on Great Pop Supplement. He plays strange acoustic music, with a nod to all kinds of classical and avant-garde influences. Frances Morgan of Plan B described his music as having ‘an edge of thoroughly chilling British oddness’. He has been a member of Big Eyes/Big Eyes Family Players since 2003. Tickets available from the bar, Piccadilly Records, Ticketline.co.uk and on 0161 832 1111.